Thinking about using the social web to do democratic things…..
Howard Rheingold was one of the first people who articulated the promise of the social web. With “Homesteading on the Virtual Frontier” he literally wrote the book on online community. Rheingold is an unapologetic enthusiast for the potential of digital community and the network society but he is also thoughtful and balanced in his examination of how we are now using social media. In the same way as ‘Homesteading’ connected with my inital bedazzlement with the potential of virtual community his 2012 book Net Smart connects with my growing sense of the fragility of many of the cultural aspects of the social web which showed so much potential for social change. Net Smart is for me an eloqent discussion of how we all could take responsibilty for making sure that the social web adds to social value. This post is a note for my literature review and I hope an introduction to the concepts he is discussing in the book – but you if you are a regular read here then I suggest you read the book yourself as its both excellent and approachable. The first chapter talks about attention and the need to relearn the ability to concentrate and control your interaction with an information overloaded environment. Mindfulness, the ability to be ‘in’ the moment of totally focused on what you are doing, is just the first way in which Rhiengold proposes a more visceral analysis of our online experience than is suggested by an information consumption model. As I sit here with 3 devices and 2 open books I am trying to relearn mindfulness. The next section deals with information management and provides an analysis of the skills which many experienced social media users develop instinctively (though these can always be challenged as was seen by Greenpeace’s brilliant anti-Shell Campaign Arctic Ready). Descriptions of source triagulation for news stories (p.80) demonstrate the active curation skills you need to make use of a tool like twitter and his later analysis of the search engine business points out the balancing of public good with commercial or politcal interest (p.85). He also touches on the social nature of authority and gatekeeping which many yet challenge the preeminance of the search engine as a way of finding news. Rheingold wants to see us developing skills of crap detection and infotention – managing multiple and parallel dynamic information flows – as an underpinning to the act of mindful participation. Rheingold expands on this by connecting it with his work on online community and mindfulness; “you exercise mindfulness when you ask yourself whether you are enriching someone or stealing part of their attention when you share a video of a revolution or a cute kitten” (P.126). This chapter discusses the role of the curator and describes it thus: “The curator role used to be reserved for the people who ran museums, but the term has been revived and expanded to describe the way populations of web participatns acn act as information finders and evaluators for each other, cresting through their choices collections of links that others can use” (P.127). He goes on to describe curation as “a form of participation that is open to anyone who might not want to blog, tweet, or update a Facebook profile but instead are happy to bookmark, tag, or like other people’s digital creations” (P.127). Where the old model of limited means of production put huge emphasis on the content creators the new model of unlimited content production creates new roles and prominance for the content curators as well as the creators. There is also a whole section on my personal favourite curation tool – tagging – “Tagging isn’t just a way to participate. It’s the fundamental building block of a whole new way of aggregatng and organzing knowledge” (P.133). He emphasising the power shift inherent in participant organised content when compared by content organised into the ontologies of often narrowly focused elites. The latter chapters discuss collaboration and the potential for action that is within the participatory culture described. He focuses on examples of online collaboration such as Beth Novecks design for the crowdsourcing of patent processing and if I were to critcise the book it is in not making the next step to connect online behaviors to offline outcomes. That being said, the intellectual architecture for this is explored in the form of a discussion of social dilemnas – where the needs of the individual are in conflict with the needs of the many – can be resolved through collaboration. Rheingold references Elinor Ostrom’s work which examines how “institutues of collective action” come together to overcome the ‘tradgey of the commons’ (Hardin, 1968). Ostrom was one of the architects of the concept of co-production in community development and so this is an important link between the two literatures. Rheingold describes collaboration as being the most purposeful form of collective action (p.154) but also describes how networking, coordination and co-operation all support and ‘lubricate’ the process of collaboration. From this he goes on to discuss Jane McGonigal’s work on gaming and her belief that gamers are becoming ‘supercollaborators’. This is the point of connection between Ostroms work on co-production and the idea that ‘gamification’ of collective action can start to provide pro-social action. Collective intelligence, as introduced by Levy in 1999, indicates the potential of networks to consciously solve problems which will defeat individuals or hierarchies and in a more deliberate way than the ‘wisdom of crowds’ model which is largely undirected. Rheingold later talks about the emotional connection between actors as being the differntiator and refers back to his 1998 essay on “The art of Hosting Good Conversations online” which is still spot on with respect to techniques for community building. “Knowing the difference between a community and a nework is as critical socially as crap detecion is essenital informationally” (p.163). 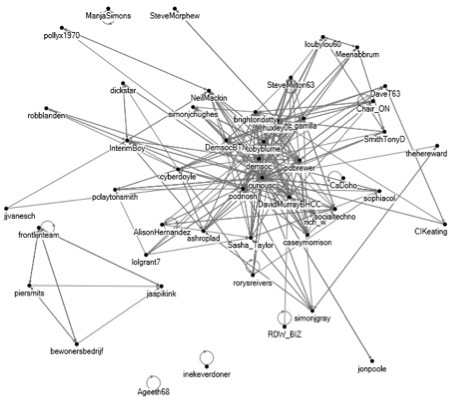 He explores a social capital analysis of online community and makes connections with social network analysis and the emphasis on weak ties / bridging capital (p.215) which is a useful link for community managers and starts to make the connection to offline behaviours. This section also returns us to the need for reciprocity in this environment and provides the practical advice to anyone looking to increase their influence to “be a bridge” (p.222). Anyone interested in learning platforms or knowledge mabagement should read the section on Personal Learning Networks (P.225) which describes self-directed learning in an online context. He also discusses learning and the skills we should be teaching children in the context of “net smart’. The whole section made me ask how we can teach being net smart to politicans – something to ponder on I think. This book codifies many of the instinctive conclusions of the experienced social web participant. It describes the need for ongoing curation and information management and the way in which your sense of self is actively created. Rheingold describes the new roles developing for curation and the essential act of appreciation and sharing within the participatory environment – he moves the discussion past the content creators to look at the whole ecosystem. He also highlights the fact that ‘social good’ or democratic outcomes are not inherent in a participatory culture – it is exactly what we make of it. It’s both exhausting and exilerating to contemplate the world of persistant participation that Rheingold describes and this is perhaps why he emphasises the need for mindfulness and also the need for human connections throughout the book. Where Sherry Turkles later work, Alone Together, seems to talk of being overwhelmed by technology Rheingold is trying to describe the tools we need to ensure we retain a directed experience of the social web. Tremendous energy is needed to exert that directional control but there there are huge potential social benefits from doing so. This is perhaps the final thought I took away from reading this book – if we are to get the best out of networked technologies in terms of social impacts that we cannot think that to do so is the easy option. We have perhaps been seduced by the ease of production into thinking that outcomes are as easy to create – as with any other medium making a difference is hard and we have to decide whether we choose to make the effort. Speaking personally – I do not intend to leave my liberty to others – but I think that before we can envisage this kind of participatory networked public sphere we perhaps need to make sure that the old elites that are currently in power are listening. Net smart is a brilliant exploration of the social web – but it highlights the vulnerabilities of the participatory culture as it grows and develops. Perhaps the final point to take away is that that those of us who value the culture of the social web as it is now need to ensure that new participants learn this net smart skills in order to avoid overwhelming the environment with entrenched offline behaviours. In my last post I talked about why I believe our leaders need be able to think strategically about what it means to be digital by default if we are going to use the power of digital networked technologies to transform the way we live. This post is about the the counterweight to this – the issue of digital exclusion. I am often out in the world evangelising about the opportunity which the network society offers us – but this work needs to be balanced by an equal effort to make sure everyone can participate. Having done a lot of presenting recently I wanted to reacquaint myself with the facts about digital exclusion to make sure that I am taking both of these messages out and about with me. For the majority of us digital exclusion is not an issue as internet use continues to rise. According to the latest ONS figures (Internet Access Quarterly Update, 2012 Q1) only 8.12 million adults (16.1 per cent) had never used the Internet and this is about 1 per cent lower than 2011 Q4 and 7 per cent lower than 2011 Q1. Digital exclusion, as with any form of exclusion, is a complex issue but clearly income and the ability to purchase access is a central element. Other elements include educational attainment, technical skills, social pressures, physical ability and at the heart of it your motivations (or lack of) for going online. This last one is critical – many people will fight to overcome other barriers if we help them find a reason to go online – this is one of the many reasons why I think the Social Media Surgery approach is so brilliant as a way of getting people online. There continue to be significant differences by age and socio-economic group across a variety of measures. And those that aren’t online are more likely to be older and from DE socio-economic groups – some 51% of those aged 65+ say they don’t intend to get the internet at home, and 29% of those in DE socio-economic groups, compared to 15% of the UK population as a whole. Looking at this issue again it is fairly striking that the policy research on this that is being referenced in Government is a couple of years old. We are talking about 2008 in terms of the CLG and 2009 in reference to the background info that formed the evidence for the Race Online Campaign (you can see the report here). I have not been able to find anything more recent and would be grateful if anyone can point me in the direction of anything more relevant. There is a game changer at hand however in the form of the smart phone: 45 per cent of Internet users used a mobile phone to connect to the Internet (ONS / ONS Internet Access 2011) and we know from OFCOM data that smartphone purchases are on a sharp rise to over 50% of contracts now being taken up (this data is all referenced here on the facts glorious facts page). The smart phone take up is also vulnerable to financial pressure and the adoption curve for new technology may well slow in the face of economic hardship – though I have heard a lot of anecdotal evidence from practitioners who say that they are finding that people will continue their phone contract in preference to their rent or food which is worrying. Sitting behind all of these factors are questions of broadband and 3G coverage – you can be rich as Croesus and have 3 PHDs but this will do you little good if you can’t actually connect to the internet. I think my final question is to ask where we think that this responsibility is sitting? The Race Online project was an effective start but I am not seeing that work being picked up with the same energy now and I am also seeing some fairly limp broadband campaigns from a number of Local Authorities (naming no names) which says to me the message has not really hit home. I am hoping that I am missing some and that there is good work going on to address this issue – if you know of something can you let me know? I think we are at a really pivotal moment with respect to where technology might take us. The promise of Open Data and Digital by Default on the one hand, the fact that the online space is still dominated by commercial rather than social forces and as a result excludes people on the other. Linking back to my post of earlier today – we need to make sure that our leaders really are thinking digital on behalf of the people who are not yet there. Exactly how digital do we need our leaders to be? I have had a fascinating week – firstly at the LGA Annual Conference and then at an APCC event to brief Police and Crime Commissioner Candidates (other briefings included Sir Hugh Orde and the heads of both SOCA and the new NCA so it was an excellent day to be part of). In both these environments I found myself asking whether or not my belief in the need for a high level of knowledge about the digital agenda is reasonable – my conclusion is that its essential if we want to evolve the relationship between citizen and state. PCCs have the potential to provide a seismic shift in power at the local level however moving from one event to the other you could feel the pull back towards Local Government as we know it now – not surprising given that the new Police and Crime Panels and many of the candidates that I have met come from this background. However even where all participants in the process are minded to keep the model as close to the current status quo as possible there will be an erosion of current systems as a new balance is found not just between the PCC and the Force they are responsible for but also between the various agencies and partnerships who are part of the wider ‘and Crime’ element of this agenda. My view is that however one feels about the concept of Police and Crime Commissioners its undeniably the biggest democratic experiment we have seen for hundreds of years – so lets not waste it. My session at the briefing on Friday focused on the democratic potential of this experiment and the need to design a democratic environment which is fit for purpose for the 21st Century. I believe that this does not mean recreating the current Police Authority in a new form and but it does mean embracing digital and networked technologies – if for no other reason than to stay in sync with the excellent work that Forces across the country are doing in this area. I’ve written more about what I mean by this here and my presentation from friday is here on prezi. We needed more space / time for debate and discussion – perhaps its time to change the balance in the agenda towards a more interactive format for some sessions. Clearly the next CSR is moving towards us and its going to be tough – however there seems still to be a lot of questions as to where the focus of this will fall and there is every chance that the impact on local government will be more insidious than a direct cut (though there will be those as well) with other aspects of the welfare budget being looked at. With respect to both of these agendas there is a growing commitment to the need for more radical redesign within Local Government – the Creative Councils Innovation session was packed for example – but I am not sure that people are yet clear on what this really means or are ready to take the risks that are inherent in this approach. My final observation may be very much skewed by the fact that I was at both of these events in order to talk about ‘digital’ in one way or another and also by the fact that this an area I know a lot about. However, in trying to calibrate my expectations of Leaders, Chief Executives and now PCC candidates around the digital agenda I am looking for an awareness of the key issues, such as open data for example, but more importantly an awareness that digital is a driver of social and behavioural change and not just a passive tool for mechanisation of process. Its for this reasons that the role of IT, and digital as a channel, should be a major element of any strategy to address the big themes which were being talked about at conference – is goes beyond efficiencies and should be a transformational tool. Everyone I spoke to would agree with this statement – but I am not sure that there is enough sector wide access to the skills which are needed in order to translate this need into the strategic planning process. In my session with the PCC candidates I said I didn’t think you should stand as a candidate if you couldn’t figure out how to use twitter – there was a quiet intake of breath in the room – but I would stand by this statement. We need to ask more of our communities – there is a growing consensus about the need to change the relationship between citizen and state both in a positive way through the localism agenda and a more negative sense through the withdrawal of unaffordable services. In asking more I believe we will need to make more central use of technology as more that just another channel – it needs to signal this change in the relationship and respond to the power that technology has offered participants in other realms. We need government to allow itself to experience the transformative effects that the media has undergone as a result of the ability for anyone active online to directly publish their own content. We ran one of the few technology focused sessions at the conference and we attracted a group that described itself as a significant minority of Members who want to know more about social media not just in terms of how to use it but in terms of the more philosophical aspects of identity and community which are central to the social impact of new technologies. This is an agenda that I would like to the see the LGA, the political parties as well as SOLACE take up more seriously in the future as we need our senior teams to take a central role in exploring and shaping what happens when we become ‘digital by default’ as a result of both financial pressures and social change. I am going to try and make this short as it will be cross-posted to the Public-i blog and that means the talented Mr Brightwell will edit it down anyway…. I wanted to talk about the Open Spaces South West and also a bit of a comment on Carl Haggerty’s post here. I have am a huge fan of Open Spaces in their many forms. I am a regular at UK Govcamp and LocalGovCamp and also a co-producer of CityCamp Brighton. I have also part of some explorations about what these kind of open spaces approaches might mean for community engagement with CRIF and also We Live Here. I repeatedly see people being inspired, excited and engergised by events which enable the participants to take responsibility for their own experience and learn from this and from each other – and its fun – I always enjoy myself and I see other people do as well. Whoever said that important stuff had to be dull? But I do think we need to see if we can make this kind of event work a bit harder and accomodate not just the new people who get so much from being exposed to a different way of working but also to create the space for longer standing ideas and projects to be worked on and extended. I also think we need to try and ensure that we expose more senior decision makers to this kind of event. The need for social innovation in the public sector is huge – and we have to start working together more effectively acrosss sectors and across organisations if we are going to start putting together some of the bigger projects that we will need to make signifincant change happen. So, Open Spaces South West will happen on a Friday because we think this should be part of your day job and not an added extra, we have some pre-programmed speakers to stimulate debate (as we do with CityCamp) and we are making active efforts to invite decision makers and non-usual suspects to this kind of event. We’ll keep you posted. Events like Open Spaces South West should help to break down boundaries and create spaces for people to lead. I was inspired by hearing Jim Diers speak last week (blogged about it here) and I was hugely struck by his incitment to build networks and relationships rather than structures – I really hope Open Spaces South West can instigate some new network and as Carl says provide opportunities for new people to be the leaders. On a slightly less lofty note – I really hope its fun. 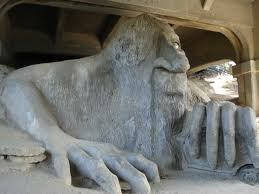 The Fremont Troll – Community co-production at its finest. I went to hear Jim Diers speak last week – it was brilliant – many thanks to Colin Miller and BHCC for arranging it. I am still trying to get hold of the slides and will share them when I do but I wanted to blog about the event while it was still fresh in my mind. Jim Diers was Director of the Office of Neighbourhoods in Seattle, created in 1988 as a response to citizen dissatisfaction in the City. He has had a number of other community development roles and now lectures at the University of Washington as well as at the Asset Based Community Development Institute at NorthWestern. He has also been invited to talk to the UK Government and was consulted by the UK Government as part of the People Powered Change programme – happily he has avoided the brand toxicity of big society association by having a hugely credible track record. The stories Jim told from Seattle were inspiring because they spoke of communities finding their own power and taking a central role in their own development. Jim described a co-productive environment where the City officials had moved out of the way and strongly saw their role as facilitators, connectors and enablers for the community. He also implied a huge level of commitment from the City and from politicians – in particular the Mayor. In the Seattle projects the question of representativeness was passed to the community to answer and was made one of the conditions of funding. I asked how the team had gone about detoxifying politics for the communities to the extent that they were positive about this kind of democratic approach and in his answer he talked about the need for persistence as well as the need to demonstrate the commitment to democracy with actions not just words. Jason Kitkat (leader of BHCC) added to this by pointing out that there is a place for politics – I think the unspoken codicil to this is its probably not within community development work. However it is a bold decision to step away and let the community act and there is an explicit need in this approach to give power away to the community. Part of why this was possible in Seattle was because the situation in 1988 was dire with many neighbourhoods needing significant regeneration and much citizen dissatisfaction – which sounds familiar in the UK in 2012. The response from the City was to do bottom up planning “because we don’t have any money” – for them effective community engagement was not a luxury. It was also possible in Seattle because they took an asset based view of community development – they looked at what communities could do not just what they – the state – felt they needed (Have a look at how Wiltshire have been exploring this approach thanks to Steve Milton ). This asset based model has been developed by the Institute at NorthWestern and the website is worth a read to explore some of the other case studies as well. There was a challenge within Jim’s ideas about the need to transform the ‘usual suspects’ as well as our politicians – the challenge being that transformation in the way in citizen/state relationship to achieve more democracy and more shared power will require us to change all aspects of that relationship – not just a top down attitude approach from politicians. Jim explicitly said he felt that much of the Community development function has lost its direction and that its contributing to the culture of dependency. This was challenged as being a difficult message to give to people who have been ‘banging their heads against a brick wall’ in their attempts to create more citizen-led initiatives but Jim pushed back with the need to transform all elements of the community development dynamic in order to really achieve co-productive results. He is challenging community development professionals to take a really hard look at whether they are needs or assets led and whether part of the transfer of power to communities is in this reframing and not just with changing the attitudes of the politicians. I have to say that I share his belief that all of the actors involved in the community development relationship need to change. In some ways this is a companion thought to the piece which I wrote on the absence of politicians in the digital space recently in that I expressed a similar feeling of appreciation for the enormous contribution but frustration for the failure to engage with a changing agenda. The challenge to change can’t just to laid at the door of politicians – the rest of us need to adapt as well and we need to do it in step with wider social changes. Diers’ emphasis was on action, on doing and empowering. In many ways he was seeing community building as a by-product of community action and this is intriguing. Many of us would agree that this is the case and it certainly echoes the positive by-product approach that we have taken with We Live Here but this principle of benefit by obliquity is very difficult to argue for in a business case constrained development environment. However focusing our metrics on the measurable is a very sensible thing to do – for example looking at network reach and depth rather than social capital as a way of measuring community cohesion. So – I have said before that evangelists are really irritating and I know that I can be counted as such on both counts and you can probably tell I found the session huge energising and inspiring. However. The caveat for me was the absence of a role for digital engagement to play a part in this work. This is probably not surprising as many of the case studies were from over the last across the last 20 years and probably predate the exponential take up of social technologies from the last 5 years. But when asked Jim was fairly dismissive of social media – and I think this is a missed opportunity not just because of some of the efficiencies and relevance that new technologies but bring but also the positive social pressure that citizens already participating in the network society can bring. We see this in the CityCamp Brighton and this asset based approach is exactly how we have been approaching We Live Here. The social network research that we use to instigate the We Live Here sites is an attempt to, cost-effectively, find the community assets who already have some of the digital skills which I think will be essential to community development in the future. Why? Because as Jim Diers said it’s not just getting communities to take over services – its about enabling them to redesign those services to fit their lives. You will need digital skills to reinvent services in the future and you will need networked behaviours to do this within the network society. But the thing I really noted from the session was a reminder of the importance of starting the engagement process with the community – not with your own organisational needs – and taking the time to build the relationships and shape the response around them. This is such a difficult thing to do when the pressure for change is immense and the natural response when in a hurry to to revert to a controlling approach. I think this is another way in which digitally led approaches can help with the amplification and viral nature of online network building speeding up this process – as long as we can then go on to take these networks offline and into the community. I think there is something really significant in a combination of this kind of approach to community development with the rigour and scale that you can achieve with successful digital projects and the cultural change that a more digitally native approach can bring. Part of the point of the action research programme I want to set up around the We Live Here work is to look at how digital techniques can complement this kind of asset based community development approach and I will also now bring in some of the CityCamp Brighton experiences and see if I can gather evidence from this network as well. I am fascinated by the cultural collisions that are brought about by really good community development work and really good use of digital as more than just a communication tool. I am impatient for these cultural collisions to start changing our political landscape and hope to do my part in bringing some of these collisions about. I am most excited however by the huge potential that I think is in our communities if we can figure out a way of unlocking and seeing first the assets and not the needs of communities. Total reach of nearly 40,000 with a contribution from the Netherlands – it is indeed a small world…. I was really lucky to be invited to participate in a 2 day workshop in Stockholm the week before last organised and hosted by SALAR, with help from Jeremy Millard and brilliant facilitation from Martin Sande. I have worked with SALAR on and off over the last five years and one of the many things which are impressive about them is there openness to external ideas. This event really came out of this as they gathered a group of about a dozen practitioners, academics and weird hybrid types like me to ‘deep think’ about how technology could and should change democratic participation in Sweden. The process was interesting; they asked us each to write a 5000 word positioning paper in advance and then present to the group (this is going to turn into a book – at some point) and we then debated these in small and then larger groups. Day two (after a well timed process intervention by Rolf) was focused on creating practical suggestions as to the way forward. They also had a ‘ginger’ group of Swedish local government people and the SALAR team to critique and comment on the process. Some overarching themes emerged from the day; openness in terms of process and data, greater collaboration, networked behaviour. There was a question running through about the nature and extent of the realisation of the network society and there was also an ongoing discussion of civic space online which I will pick up separately as this is a big topic in its own right (picked up by Andy Williamson in his paper in fact). We wanted to create something which would allow the team and SALAR to start working towards change without having to have complete clarity of the final destination so we discussed the idea of a collaborative audit which would establish the readiness of a Council to move forward against the values which we had described. We suggested that research needs to be embedded in the process and proposed some specific experiments which could be bridges between the current and new reality. This is by no means finished thinking and it is something that some of us want to keep talking about as it felt like a practical way to start effecting change in an environment that has no burning platform for change. This last point, the fact that Sweden is actually in very good financial, social and democratic shape compared to other european democracies was addressed by the other group who discussed the rapidly approaching issue of the ageing population and how to bring this debate to the centre of current political thinking. It is odd to think of the UK as being ‘lucky’ with respect to our financial crisis but if you do believe that the pressure of social change is demanding that government transforms itself then the more pressing financial problems have to be seen as a good thing in that they place the need for innovation on everyones agenda. Never waste a good crisis as they say. I’d like to thank our hosts and the other participants. As I said at the start I often feel like something of a hybrid – not quite academic and not quite practitioner – and it was refreshing and exhilarating to be in the company of other action researchers to discuss both theory and practice. I do hope we get to do it again. The Machine layer refers to protocols and TCPIP or the convention of things like HTTP. The infrastructure layer refers to choices of operating system or web server (for example the choice of open source Apache vs a proprietary web server). 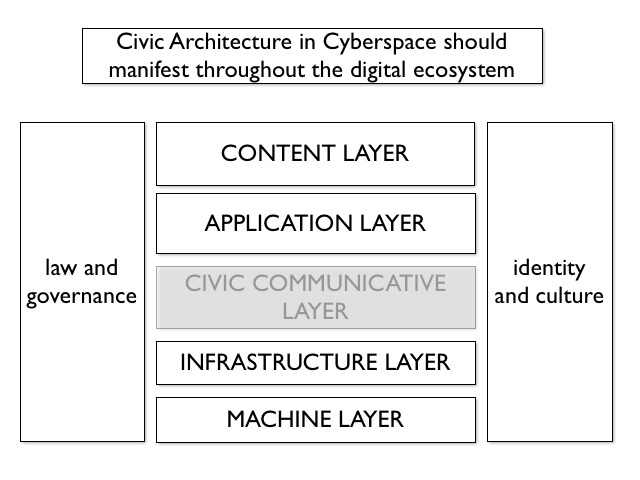 The Application layer refers to things the specific service such as Facebook or Twitter and the Content layer is as it says – the content – and includes the semantic information needed to make this portable and accessible.
. Running through all of these layers are on the one side the rule of law and the organisations managing this and on the other the influences of culture and identity which effect choices in each of these layers. There are alternatives which might also deliver civically vibrant online space; for example the new economy might create collaborative and open norms or improved take-up of open source technologies by content creators might swing the balance in favour of a more civic digital ecosystem. However, while waiting for these outcomes to happen and while matters of identity and culture develop I am proposing we ensure the robust existence of a civic communicative layer. Carl Haggerty on Surveillance or Participation? Jonathan Flowers on Surveillance or Participation? Gordon Rae (@socialt… on Surveillance or Participation? curiouscatherine on Surveillance or Participation?